Derek Carr threw for 5,082 yards and 50 touchdowns in 2013. 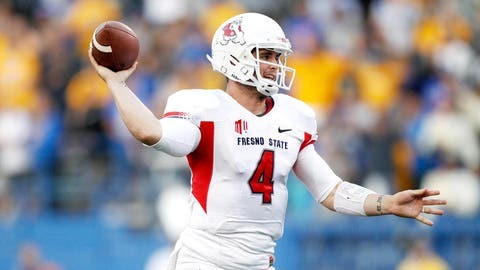 Fresno State quarterback Derek Carr left his private workout with the Browns last month, saying that “everything went great.” The feeling is mutual as Cleveland brass will use one of its coveted top-30 visits on the quarterback. The Browns have scheduled Carr for a visit next week, a source told FOXSports.com. The 6-foot-2, 214-pound quarterback is also scheduled to meet with the Bucs this Wednesday, despite having Josh McCown and Mike Glennon on the roster. Carr’s immense production (5,085 yards, 50 TDs) during his senior season, leading Fresno State to an 11-win season, has him among the elite quarterback in this year’s draft class. The Browns own the No. 4, No. 26 and No. 35 picks and certainly have a priority in selecting a quarterback.